10 ft. 1-inch, 54-inch x 22-1/2-inch Steel Attic Ladder with 300 lb. 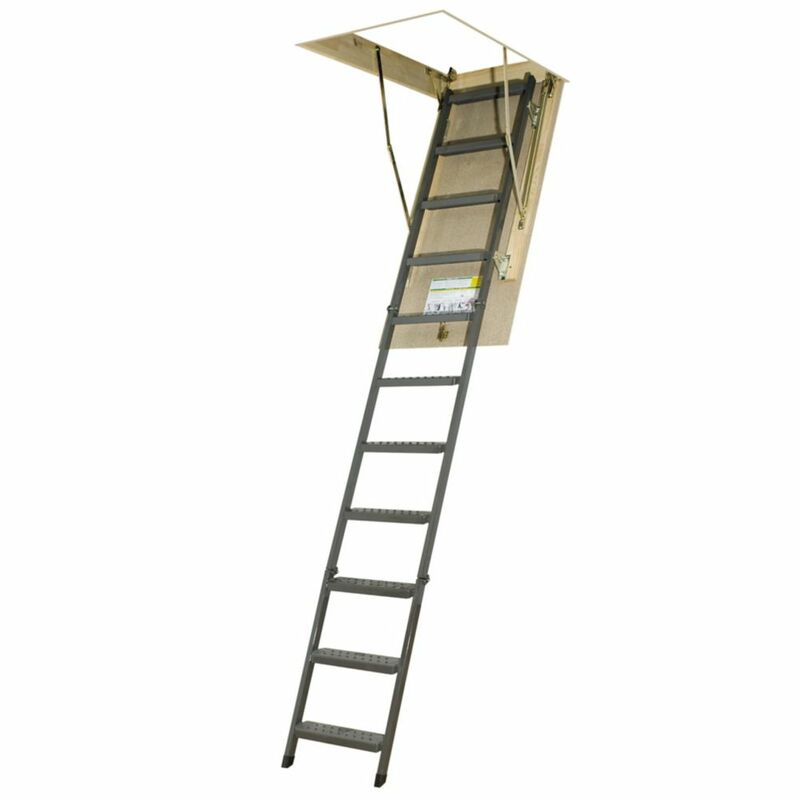 Load Capacity Type IA Rating Built for safe usage, the Fakro Steel Attic Ladder is designed with a locking mechanism along the inside surface of the door for added security. The attic door is well balanced and opens and closes easily without sudden movements, with springs located on the door surface to create a wider opening to your attic for comfort and safety. Built to accommodate a variety of home designs, the ladder is adjustable in length, door distance and spring tension to suit the needs of your space. 10 ft. 1-inch, 54-inch x 22-1/2-inch Steel Attic Ladder with 300 lb. Load Capacity Type IA Rating is rated 4.3 out of 5 by 13. Rated 4 out of 5 by Me from Sturdy Ladder is sturdy and looks good. Easy to operate. Only complaint is the plastic feet. Too small, in fact so small they were ripped by who ever put them on at assembly. I made oak feet that insert into the side frames to replace. Otherwse steel on concrete and the angle would be wrong. Rated 5 out of 5 by Travis from I wish there were more ladders available with coil springs. All good, installed by myself and got it done. One feature of this ladder that you should not over look is that it has COIL SPRINGS anchored with steel instead of GAS STRUTS with plastic hardware... do you know what happens to gas struts and plastic when it is 20 below???? The plastic cracks and the gas springs do not work. Rated 5 out of 5 by C5rocket from Excellent attic ladder As mentioned by a couple of other reviewers, the packing is suspect. The ladder frame was damaged in shipment, but I was able to repair the frame. This ladder replaced an old wood ladder that was very flimsy. This is an extremely stable heavy duty ladder. The springs are attached to the door that allows for a wider opening. Springs that are attached to the actual ladder protrude into the opening. I highly recommend this ladder. However, the packing for shipment needs to be addressed by Home Depot. Hopefully someone at Home Depot will read this and address this deficiency. Rated 4 out of 5 by NewsByScott from Love the ladder- install could've been better So I ordered the ladder online. It arrived about a week later. No problem there. Contractor came and we opened the box. Whoa- what are these broken plastic pieces? No idea- they're not listed in the instructions. As a matter of fact, the instructions do not have a parts listing.. despite the table of contents saying it's on page 5. Not! Then the installation instructions themselves- did I buy this at Ikea? It's all pictures.. no words. Well- if you take your time and just go one step at a time it'll be fine- but don't expect a detailed installation guide. I am not pleased that the actual door is made of particle board but the ladder is nice and sturdy and the latch works well. Just have someone with some know-how helping to install it, otherwise you'll be frustrated beyond belief. Rated 5 out of 5 by JRWilli from And Two Thumbs Up This is an outstanding attic ladder, light years better than the ones we grew up with. The steel ladder is solid and sturdy, no more wobbly knees. The spring mechanism is placed on the door so it is out of the way, no chance for snagging your clothes. It does require you to push the door closed to latch it, but is not difficult to do. My ladder was shipped and delivered very quickly with no damage. It did NOT come with installation hardware, but only needs two lag screws, about ten large screws, and a couple packs of shims. The instructions are clear and easy to understand, they still primarily use pictures though. I installed the unit myself, which means planning on a way to get back down. I did remove the ladder before lifting it into position to reduce the weight, it’s just four bolts. I also placed boards across the bottom of the ceiling opening to hold the unit up instead of their method of strings and wedges from the top. Cutting the ladder to length was a little challenging as my ceiling height placed the first step in conflict. My garage floor slopes for drainage and the legs are a little over 1/4" different from each other. The ladder is adjustable for the step conflict, but I did not have confidence it would be right. I removed the first step and then cut the legs to fit. Using a fresh hacksaw blade makes it easier although it still took me several minutes to cut through all that heavy steel!! I did not have trouble with the feet like the other reviewers did. I am surprised this ladder doesn’t have any 5-star reviews. This is by far the best ladder I’ve ever climbed up and down, and the best purchase I’ve made in several years. I am very pleased with this ladder, so pleased that I am planning on buying their insulated version for inside the house. Rated 4 out of 5 by Installer from This steel ladder is very sturdy. It opens and closes easily. There was some slight damage do to shipping which has happened to both of the ladders I have ordered and installed. It was easily repaired with glue and brad nails. The product itself is of good quality. I recommend the steel ladder over the wood if the price is justified. The steel ladder is very sturdy and yet seems no heavier than wood. The design works well and should provide years of solid service.